Modal windows that UpdraftPlus opens can't be clicked on? Modal windows that UpdraftPlus opens can't be clicked on? Note: Some steps have been taken in UpdraftPlus to overcome the actions of other plugins that cause the problem below. If you’re not on UpdraftPlus 1.7.21 or later, then please update. Otherwise, continue! This is caused by another plugin you have installed, or perhaps your theme. That plugin or theme is loading its code onto UpdraftPlus’s settings page (instead of only loading its code on its own page). That problem is then compounded by that code conflicting with UpdraftPlus’s own code. Here is an (incomplete) list of plugins known to do this, at least at some point in their history – please let us know if you find another, so that people finding this page in future can find their problem quicker: Nextgen Plus + Nextgen Pro + Photocrati theme (December 2014 – fixed in January 2015), “WP Shortcodes”, “WP Events” (2.2.4.1), “The Events Calendar” by Modern Tribe (3.2), Font Resizer (1.2.3), Agent Extension Standalone Plugin/Agent Image News (one of the two – which one is unconfirmed) (present in version ?1.3). To find the culprit (if it’s not one of those), de-activate your plugins one-by-one, and switch to a default theme (e.g. Twenty Twelve, Twenty Thirteen), to find the culprit. 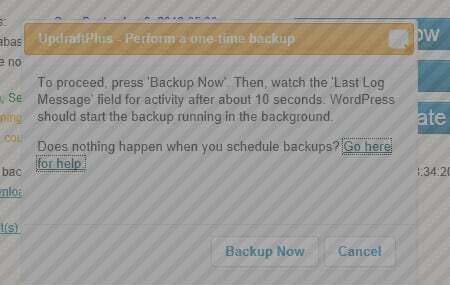 (When the culprit has been disabled, reloading the UpdraftPlus settings page and clicking on “Backup Now” will no longer manifest the problem). If you have lots of plugins, then you can work quicker by “bisecting” – i.e. de-activate half of them, and then depending on the outcome either re-activate that half and work on the other half, or re-activate half of that half. When you find the culprit, please report it as a bug using the support mechanism for that plugin. (Or permanently de-activate it or replace it, depending on whichever you find most convenient). Ask them to make sure that the plugin/theme’s code is only loaded on its own pages, and not everywhere.